Part of a fabulous panel of Fantasies of Control at the Law, Culture, and the Humanities on March 22. Giving a keynote address on "Why you probably don't need a blockchain, but why you sorta' kinda' might?" in Washington DC at the Filene Intitute Credit Union Governmental Affairs Conference on March 8 (not open to the public). Part of two fantastic panels at next year's ICA in Prague. One panel is in the Communication History division, "Data Takes Command: Histories of Commercial Information Systems in the Late Twentieth Century" and one is in the Philosophy, Theory, and Critique division, "Global Perspectives on Money Technologies and Communicative Practice." I'll be talking about Paid: Tales of Dongles, Checks, and Other Money Stuff at PayPal in San Jose April 14. In Tartu, Estonia, Octover 18-21 for Association of Internet Researchers. Presenting research about blockchain and music with Nancy Baym and Andrea Alarcon, Oct 18 at 9am, and then doing a fishbowl on the intersection of Money Studies and Internet Studies at 11am with Noopur Raval, Rachel O'Dwyer, and Stu Geiger. "Histories of Money, Credit, and Payment as Communication Technologies," with Finn Brunton, Josh Lauer, Michael Palm, moderated by Caroline Jack, International Communication Association, San Diego, May 25-29, 2017. "The Informational Imaginaries of the 'Cashless Society'" at The Conquest of Ubiquity, York University, Toronto, May 12-13, 2017. I talk the Quadringa debacble on CBC Radio's The Current. Watch me talk about cryptocurrency on an episode of Explained, a Netflix original series. 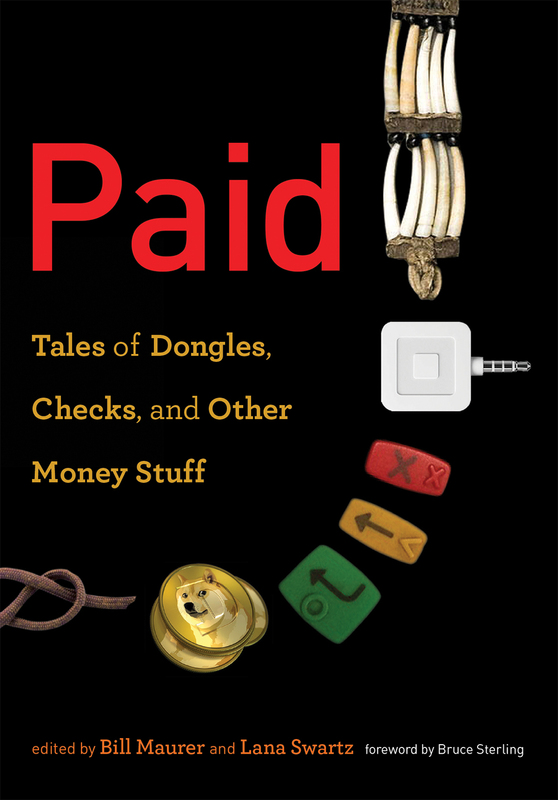 Paid: Tales of Dongles, Checks, and Other Money Stuff is now out in paperback! Paid: Tales of Dongles, Checks, and Other Money Stuff is a part of the 2018 Goldsmith Political Economy Research Centre's Heretical Finance Reading List. I tried to answer the question, "What Diner's Club Card Reveals About the Nature Of Money?" on Bloomberg's Odd Lots podcast. I talked about Paid, bitcoin, the cashless society, and other research with Joe McGonigal on Slice of MIT podcast. Rebecca Spang wrote a very insightful review of Paid in the Financial Times. E-mail me if you can't access it. First in a series of posts with Bill Maurer for Socialising Finance on cash and stuff. I went on News Radio WINA to talk about the question: Are we working toward a cashless society? UVAToday did a profile (with really cool animated video) on some of my research on cash, cashless, privacy, and justice. "A cashless society? Not so fast!" Alexandra Lippman made money music playlist for our book, Paid: Tales of Dongles, Checks, and Other Money Stuff. In September 2016, I was a guest on BBC Newshour Extra with Owen Bennet Jones, The End of Cash? My collection, co-edited with Bill Maurer, Paid: Tales of Dongles, Checks, and Other Money Stuff is out from MIT Press.